HTC Americas president Jason Mackenzie has just wrapped things up from the Barclays Center in Brooklyn. 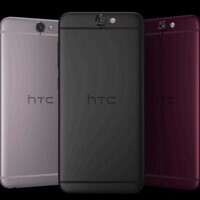 While there were basically no surprises with the announcement of the HTC One A9, the executive did mention that there will be an "Unlocked Edition" of the handset. This model will come SIM free and allows you to select the carrier of your choice. In addition, the bootloader can be unlocked, allowing users to install custom ROMs. And unlike other manufacturers who offer an unlockable bootloader, but then threaten to void your warranty when you do, unlocking the bootloader on the HTC One A9 will NOT void HTC's warranty. HTC also promises that the phone will launch with minimal bloatware, and Android updates will arrive no later than 15 days after Google starts pushing them out to Nexus models. The HTC One A9 is available to be pre-ordered right now, directly from HTC's website (HTC.com/us/) starting at $399.99. This is a special pre-order price, available for a limited time. HTC that is just fantastic. Too bad I don't want to carry around an iPhone knockoff. well the differences: same bad screen body ratio, htc better ppi htc better sound htc i can bet 100% better battery, well my girlfriends htc m8 holds longer than iphone 6s, sd card for htc. the only thing iphone done better is probably camera which i do not use, prefer dslr but still i prefer my galaxy edge, flawless peace of art and technology. Okay, say whatever you want about the design of this phone and who copied from whom. BUT, I will not hold a phone everyone would think it is a cheap clone of iPhone. Admit it or not, This typical design became a well-known iPhone design. Sounds like the people around you are too critical or you care too much about what people think of the stuff you hold. If it's not people close enough to you that you could talk about what's in your hand, who cares? so what? other people will do! your preference isn't everyone else's. I could understand when they had the buttons on the black stripe then i could understand because they had still speakers but now there is a stripe that big for no reason!!!!???? HTC had that design FIRST you imbeciles!!! !